“Sing a new song to the Lord, for God’s Love is everlasting.” We gather today to celebrate the Eucharistic Liturgy of Christian Burial for our Sister Alice Regina McGinn. Our coming together in Annunciation chapel this morning is a fitting place to sing and pray for Alice, who had great devotion to our Blessed Mother, and sang in many parish and ecumenical choirs during her missionary religious life. When Sister Alice’s physical condition began to deteriorate a few weeks ago, she was placed on hospice care. She slipped peacefully and gently into the arms of our Loving God on the evening of May 27, 2015 in our Maryknoll Sisters’ Center, Maryknoll, New York. She was 93 years young in January, and celebrated her 75th jubilee as a Maryknoll Sister this past February. Alice attended St. Mary’s Academy in Providence, Rhode Island. She was involved in the Sodality and was an accomplished tennis player. A month after high school graduation, Alice entered Maryknoll on July 2, 1940 at the Motherhouse. Her eldest brother, Rev. John A. McGinn, MM was already a Maryknoll priest, and Alice wanted to join the Sisters’ community to fulfill a hope to “go to the missions where she, too, felt called to go.” At reception, Alice received the name Sister Alice Regina, a name she retained throughout her Maryknoll life. She made her first profession of vows on March 7, 1943 at the Motherhouse. Shortly after first profession, Alice was assigned to the Maryknoll Fathers’ Junior Seminary in Los Altos, California, where she worked from 1943-1946. She professed her final vows in Mountain View, California on March 7, 1946. She realized her dream of going to the foreign missions later that year when she received an assignment to the Bolivia-Peru Region. Alice began her South American ministry after language school in Bolivia. She helped in a primary school and was the principal in Cobija on the northernmost frontier with Brazil from 1948-1954. Later she became the principal of a primary school in another frontier town, Guayaramerin. 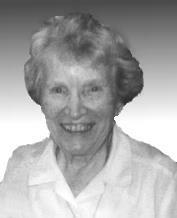 From 1958-1964, she taught in the parish primary school and was the director of a catechetical program in Cochabamba. Alice also did home visiting in some of these rural towns, many of which were isolated villages accessible only on horseback. Following her renewal in 1964, Alice attended Mary Rogers College, earning a B.S. Ed. degree in 1967. Returning to South America, this time to Peru, she worked in Puno and Capachica from 1968-1970, where she taught catechists, and organized a chicken cooperative in response to the economic plight of the people. Alice returned to the United States for congregational service in 1971. She worked in promotion in collaboration with the Maryknoll Fathers from 1971-1976; first in their West Roxbury and Brighton, Massachusetts offices, then at Maryknoll, New York, and later in New York City. She was a tireless promoter, covering an area from Boston to Buffalo, giving church talks and sharing her South American experience through mission education programs in the schools. In 1974 when the Maryknoll Fathers’ Promotion office moved to New York City, she moved to the Maryknoll Sisters’ Washington Square house. Alice was assigned to the Eastern U.S. Region in 1976, and relocated to Bristol, Rhode Island to be nearer her family. She continued to work in the Fathers’ Promotion office serving as Office Manager for Connecticut until 1977. During these years, she attended Sawyer School of Business in Providence, Rhode Island, where she received a diploma as a career secretary, and then later did secretarial work at two local colleges. A new phase of her missionary journey began in 1978 with the Providence School Department, one that would last for the next ten years. Initially, Alice taught English as a Second Language in three programs: one for Vietnamese, Laotian, and Cambodian immigrants; one at the Providence Adult Learning Center, and another at the International House of Brown University, where she tutored foreign language speaking students. Alice took graduate courses at several local universities and colleges in 1978 and 1979 to fulfill requirements for Rhode Island state accreditation. She focused her studies on bilingualism and the analysis of teaching foreign languages. In 1979, Alice was hired by the Providence Public School system as a bilingual teacher for Hispanic students in Grades 1-3. From 1980-1986 she taught at the Vineyard Street school and then at the Gilbert Street school. She received the Rhode Island State Department of Education District Teacher of the Year award in 1981. She also taught First Communion classes in Spanish at Assumption Parish for many years, and volunteered in the library at St. Francis Chapel. Teaching was just one of Alice’s many ministry involvements. She was actively involved in many parish activities and civic groups in the local area with an emphasis on Catholic social justice issues. For several years, she was chaplain for the Women’s Guild of the Ancient Order of Hibernians, and was often seen wearing her green blazer and waving happily to all during the annual St. Patrick’s Day parade through the streets of Providence. During her thirty-six years of mission in Providence, Alice made many life-long friends among religious, clergy, and laity in the diocese. Her generosity, enthusiasm, and kindness are remembered by innumerable people there; her former students, the local shopkeepers and police officers, her neighbors, parish staff, and parishioners alike. After she retired from teaching, Alice continued as a lector and a Eucharistic minister, and sang in the choir at Assumption Church, her local parish, until she had a fall in the autumn of 2009. Following two months of rehabilitation, she moved to St. Joseph Living Center, an assisted living facility for the Diocese of Providence. This move, however, did not signal an end to Alice’s pastoral ministries. Ever the missioner at heart and in action, she moved about the facility with her walker providing support, an encouraging smile, and a listening ear to the other residents, and conversing in Spanish with some of the employees. Together with a retired deacon and a priest, who were also residents at St. Joseph’s, she began a regular Holy Hour in the small on-site chapel. While there with the help of friends, Alice continued to go out weekly to attend Scripture classes and count the Sunday collection at two nearby parishes. A year later in 2010 when the diocese closed St. Joseph’s for financial reasons, Alice was warmly welcomed to live at the Franciscan Missionaries of Mary Sisters’ assisted living residence on Fruit Hill Road. She remained there happily until 2012 when she suffered a stroke, which ultimately necessitated a transfer to Maryknoll for full-time care. Alice was assigned to the Eden community in 2013. Here she enjoyed reconnecting with her many Maryknoll Sister’ friends from their years together in the Bolivia, Peru, and Eastern U.S. regions. We in the Eastern U.S. region, along with the Sisters and staff of Maryknoll Sisters’ Homecare, who devotedly attended to Alice’s needs, remember her as a gentle, cheerful presence. She was ever ready to lend a helping hand or offer a personal word of concern to those she met. At times independent, often spunky, yet always grateful to others for any kindness shown to her, she was the epitome of a gracious woman. We will all miss her sparkling blue eyes and impish smile. And we thank all the Homecare Staff who assisted her. Throughout her years of mission in Rhode Island, Alice’s many nieces, nephews, grandnieces, grandnephews, and their spouses continued to express caring concern and deep affection for their beloved “Aunt Alice,” often visiting her and including her in family gatherings and excursions. We welcome several members of her large extended family here today, who join us in celebrating her life. We also welcome Fr. Shaun Crumb, our Maryknoll brother, newly ordained last Saturday and Fr. Robert Beirne, Diocese of Providence, a longtime friend, who will preside at this Mass of Resurrection for our Sister Alice.